During my travels in England, I had an adventure that I didn't tell anyone about until I returned home. 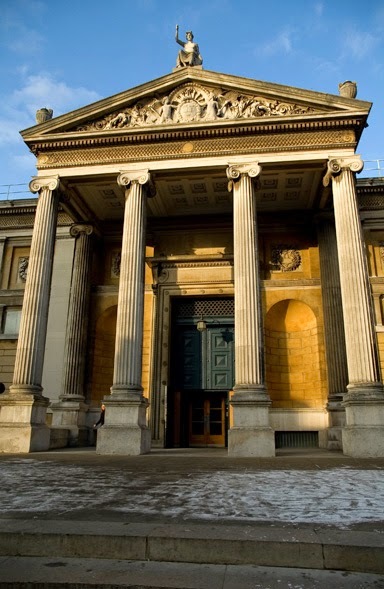 One morning when I visited the Ashmolean Museum in Oxford, I went down the stairs near the entrance to the ground floor to the cloakroom. As I descended the stairs, there was a red carpet covering a stair near the bottom. A warning, but of what? With my bifocals, which those of you who wear them will understand, downward looks can be distorted. I understood the red carpet warning to be about the last step, but - alas - it was not so. There was one more low step beneath the red carpeted step, which was more or less the same color as the floor, and I missed it and began to fall. Though I tried to catch my fall with my hand on a nearby pillar, I spun around in an intricate and ungraceful ballet maneuver and landed on my padded bottom and banged the back of my head hard on one of the metal lockers lining the wall. I sat dazed for a minute or two, but I never lost consciousness. A museum employee came running toward me and immediately called the first-aid staff person to tend to me. When he came, he told me to sit for a while and began asking me questions. After a few minutes, he asked if I wanted to try to get up, which I did because people were staring. I managed to get up with his help, and I walked on my own to a room away from public glare. He looked at my pupils, asked me if I could see and hear and if I'd lost consciousness. He looked at my hand which had struck the pillar. It was red but not really injured. He didn't look at my bottom where I landed, but it was well-padded as I've already said, so no injury there. I've seen pictures of what happens to the brain from a blow on the back of the head; the blow forces the brain forward where it collides with the front of the skull. The back of my head where I hit the metal locker hurt, as did my neck and forehead. I assume the neck pain was due to forward force, sort of the opposite of whiplash. The first-aid person asked questions, took notes, and asked me to sign a paper in which I agreed that the notes he'd made were correct, which they were, and I signed. I presume the papers were necessary in the event I decided to litigate, which I will not unless unforeseen complications develop, which is highly unlikely, as I am fine now. The employee told me the signs to watch for indicating a concussion, but I already knew them from having three children who received blows on the head in the course of their childhood. Not from their parents, I should add, but rather from the vicissitudes of life. I worried about concussions in my children after head blows, but one of my sons did suffer a concussion at age two or three from falling off the bed while he was jumping on the bed, and it was immediately obvious something was very wrong. The gentleman finally told me he had done all he could do and asked me if I wanted him to call for further help or walk me back to my hotel, which was only a short distance away. I said no, but I thought a cup of tea would do me good, and if I needed him to walk me back to my hotel, I would call for him. He took me to the café and got me tea. I took a paracetamol and drank my tea slowly and started to feel better. When he came back to check on me, I told him I would continue my walk through the museum. You know, carry on, if you can. When I was done at the museum, I made my way back to my hotel in time to meet a friend. For a few days my head, both in back and in front, along with my neck were sore and painful, but paracetamol relieved the pain, which was not severe. All things considered, I was very fortunate, because I took a hard blow. I told no one about the accident at the time, because I knew my family and friends at home and in England would worry for the rest of my stay. Perhaps the decision was unwise, but it's what I thought best at the time, and, in the end, I was all right, at least as all right as I was before the fall. All's well that ends well, and it's over now. The safety expert who ordered red carpet on the next-to-last step made a mistake, in my opinion. Red carpet warning! Be careful! Of what? Not this step, but the next step? That's not how my mind and my bifocals work. JCF, thanks. Paracetamol is the English equivalent of our acetaminaphen (aka Tylenol), the non-aspirin pain-reliever. I had a small pack with me when I fell. I believe it may work somewhat better than our remedy here. So grateful that you are OK. And only bifocals? Now that generates a little envy from one who has had to wear trifocals for years. Bonnie, trifocals would be too much, though I could do with help for the middle distance. Actually, for the middle distance, as on the computer, I see quite well without glasses. Glad you lived to tell the tale. But I would certainly write a hot letter to the director of the museum about that red-carpet step. Russ, I've thought about writing a letter to help prevent further accidents. A warning on the next-to-last step doesn't make sense to me. Thanks, Tim. I was very fortunate.